The 2017 Dodge Challenger T/A 392. My ninth car of the day was one of the most fearsome...the 2017 Dodge Challenger T/A 392. 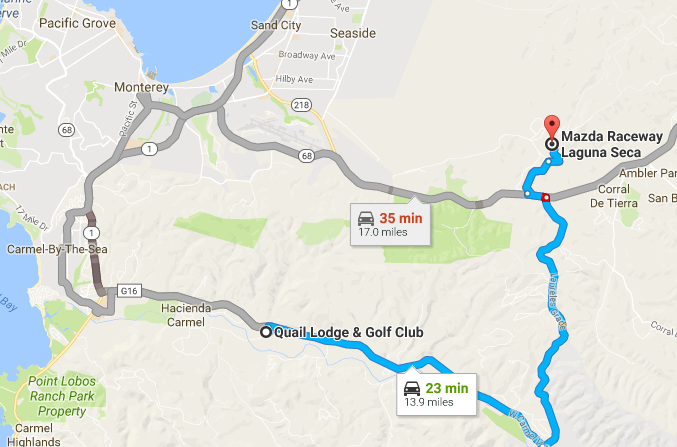 Quail Lodge to Mazda Laguna Seca Raceway via Laureles Grade (courtesy Google Maps). 2017 Dodge Challenger T/A 392. The 2017 Dodge Challenger T/A 392 is only three rungs down from the top of the Dodge Challenger hierarchy. Above it, the SRT 392 with the same 485-horsepower 6.4-liter Hemi, but with configurable drive modes, the Hellcat, with a supercharged 6.4-liter Hemi making what until recently was considered an insane 707 horsepower, and the soon-to-be released (or is that unleashed?) Demon with 808 horsepower. Trust me, the T/A 392 is more than enough power for anyone not intent upon breaking laws of man and physics. Packing the same power as the 2017 Dodge Charger Daytona 392 I'd driven a couple of hours earlier, it knocks off 0-60 in roughly the same four and a half seconds, but being in a slightly smaller package heightens the sensation of speed. The good news is that, like its bigger brother, the Charger, what we have here is a muscle car that blows away "golden era" cars from the 60s not only in straight-line performance but in handling and braking power. 2017 Dodge Challenger T/A 392 interior. And, like its big brother, it gives you a comfortable, if business-like, place in which to do your driving. As a value proposition, the 2017 Dodge Challenger T/A 392 is a pretty good one, with a base price of $44,995. I won't attempt to do the guesswork as to what optional equipment the one I drove might have, but I found three within 25 miles of TireKicker World headquarters in Folsom, one at $47,785, one at $49,080 and the third for $51,840. Having not yet driven a Hellcat or Demon (and frankly, not entirely sure I want to), this stands as the hottest Challenger I've ever driven. Getting one of these instead of one of those would by no means be settling.